The work in Pale Horse takes its inspiration from the Apocalypse Tapestries, completed in Angers, France during the 14th century. Moments from that work transform and find their way into the paintings of Jenna Beasley and Anthony Cudahy. 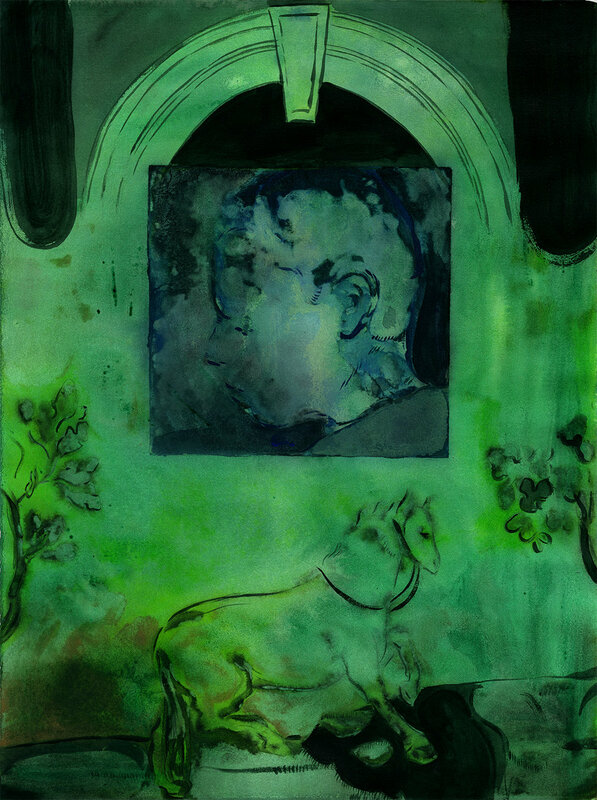 Anthony Cudahy is a painter in Brooklyn, NY. He is currently enrolled in Hunter College’s MFA program. In 2018, he presented a solo exhibition, Night Paintings, at 1969 Gallery (NY, NY) and has shown at The Java Project (Brooklyn, NY), Farewell Books (Austin, TX) and Mumbo's Outfit (NY, NY). He has been in group shows at Big Pictures LA, 68projects (Berlin), Danese/Corey, MULHERIN NY, NO FOUNDATION (Toronto), Practice, Harpy Gallery, and ATHICA, among others. His work has also been featured and reviewed in publications including Painters on Paintings, Strange Fire Collective, Mossless, the Paris Review, Hello Mr., and Cakeboy. He is a former resident of the Artha Project. Dashwood Books produced a zine in 2017 of Cudahy and his husband, Ian Lewandowski's, work. Anthony Cudahy’s painting practice utilizes sources such as personal photographs, queer archival documents, and art historical imagery, to translate and distort them into an assemblage. Jenna Beasley (b. 1987) lives and works in New York. She received a BFA in Painting from Indiana University in 2011 and is currently an MFA candidate in Studio Art at Hunter College. In 2016 she was the recipient of a Fulbright Grant to teach and live in Madrid, Spain. Jenna has been included in recent exhibitions at the Fuller Projects in Bloomington, IN, Espacio Mediodia in Madrid, Skylab Gallery in Columbus, Ohio, and Hunter College’s 205 Project Space in New York.